It’s like rain on your wedding day. It’s a free ride when you’ve already paid. It’s a strongly conservative news network blatantly copying the logo of video game in which the villain is a strongly conservative evil mastermind who wants to destroy the world. Not only is one of those things actually ironic, but it also actually happened earlier this week. 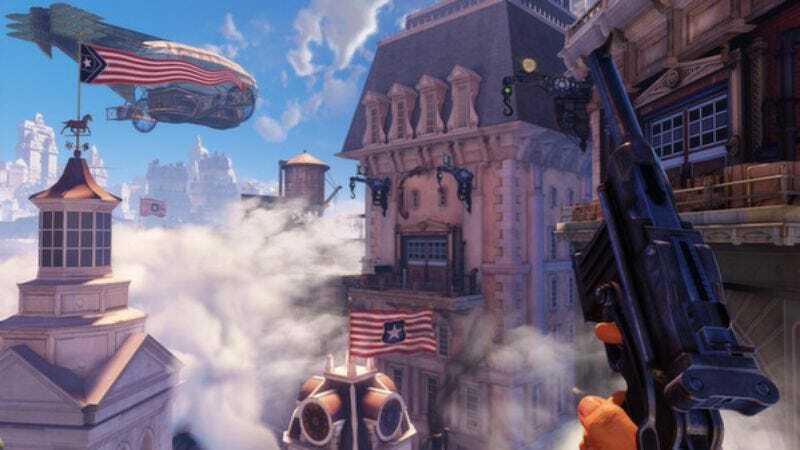 First, the backstory: BioShock Infinite is a game that takes place in a flying city run by a religious zealot named Zachary Hale Comstock. He has populated his city with racist assholes who literally worship America’s Founding Fathers, and he uses American iconography to rile up his citizens in support of a war with all of the heathens of the world that aren’t a part of his flying city. Meanwhile, in the world of cable news channels, there’s a network called Fox News that is known for leaning a bit conservative. At the risk of saying something overtly political, we’ll just let you make your own connections between the flying city using patriotism to push people into war and the TV network that paired footage of the U.S. bombing Iraq in 2003 with a waving American flag. The above picture comes from Ken Levine, the creator of BioShock (via Nerdist), who seemed more tickled by it than annoyed. “Glad to help, Fox. Glad to help,” he posted on Facebook. You can see the original Infinite logo below and compare them yourself, but the funny part here isn’t that Fox News copied it—which it totally did—it’s that it apparently copied it without recognizing what the logo represents: A violent video game about killing right-wing crazy people. It would’ve been weird for Fox News to take any game’s logo like this, but for it take the one with a message that specifically diverges so strongly from its own? That’s irony, Alanis.